Vehicles crossed over rail tracks on Brighton Street in Belmont where a train had earlier struck a car on Friday. 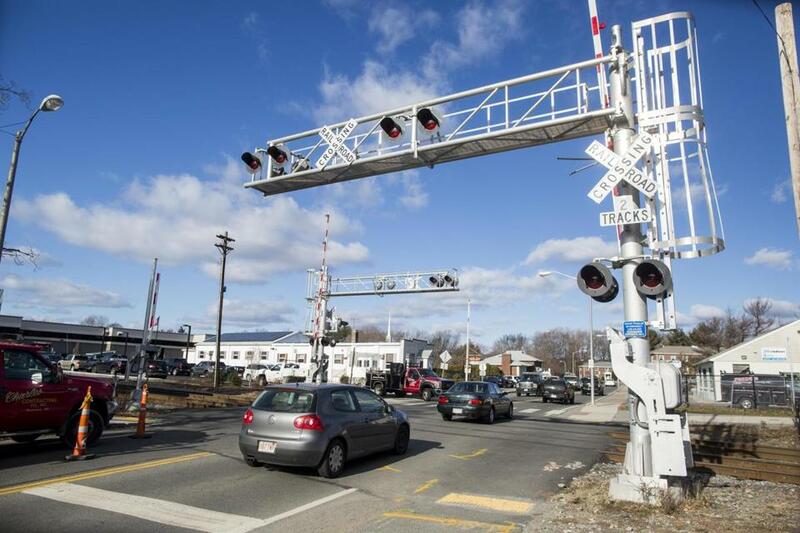 BELMONT — As the warning lights flashed and the safety gates went down at the Brighton Street commuter rail crossing Friday morning, horrified bystanders watched in disbelief as a train barreled down on the car sitting trapped on the tracks. Cars began honking, and two boys — aged 11 and 10 years old — fled from the car. But a 6-year-old boy was still inside, officials said. The driver, a 58-year-old woman, rushed to get him out, but it was too late. The inbound Fitchburg Line train crashed into the back of the car, sending it spinning into the woman, who was seriously injured. The little boy inside was safe. 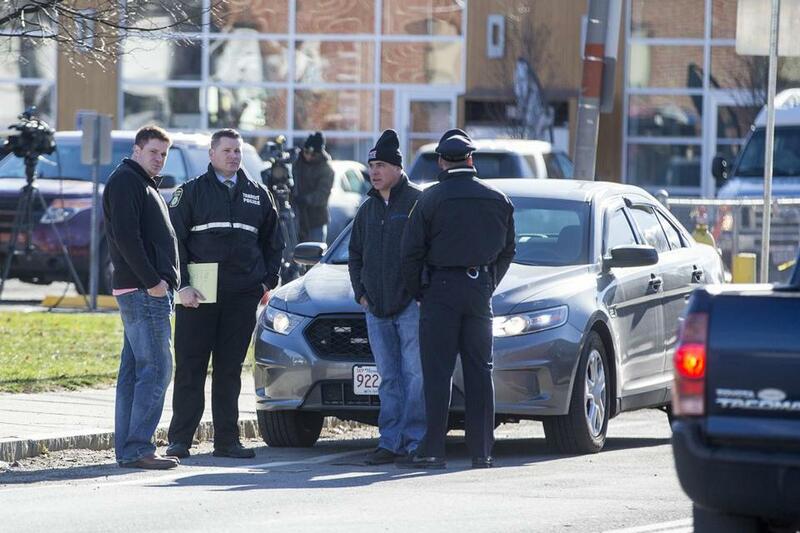 The woman was taken to Beth Israel Deaconess Medical Center, Sullivan said. The boys were uninjured, but were taken to a Boston hospital for observation. The woman is the mother of the 11-year-old boy, Sullivan said, and the two other passengers were brothers. All three are classmates, he said, though he did not identify the school they attend or say whether they were en route to it. At the time of the 8 a.m. accident, Sullivan said, the lights, horn, and gates were functioning at the crossing. How and why the woman’s car was on the tracks even though the safety controls were operating is under investigation, he said. Witnesses said the woman appeared to have been hemmed in by traffic. According to Keolis spokesman Leslie Aun, trains are authorized to travel through the Brighton Street crossing at 75 miles per hour. Sullivan said the investigation will determine how fast the train was traveling at the time of the impact. The train’s operator “did try to stop,’’ said Sullivan. Bennett said the woman driver appeared frantic, as if she was trying to get someone out of the car. People were running to help, he said, but it happened so fast that no one was able to reach her. Heidi Cho, who was waiting for a bus about 100 feet away, said she saw children run from the car as the train approached. The train blew its horn, said both Cho and Bennett, but could not stop altogether. The train hit the car with a bang, Bennett said, spinning it so hard it wound up facing the other way on the other side of the street. He couldn’t see the woman anymore and thought at first that she had been killed. He said there was heavy traffic at the time of the accident, and there were cars in front of and behind the woman’s car on either side of the gates. “It shook me up,” he said. Karl Redgate, a passenger in the third car of the train, said no one on board felt any sort of impact. Redgate said a conductor announced to passengers that the train had hit a car, and the passengers remained on the train until about 8:45 a.m.
Aun said about 500 passengers and crew were on board Train 408 during the crash; none was injured. Officials remained at the scene after a car and a train that were involved in a crash Friday in Belmont were moved. @globe.com. Follow her on Twitter @oliviasquintana.